June 19, 2002 - A beautiful morning. 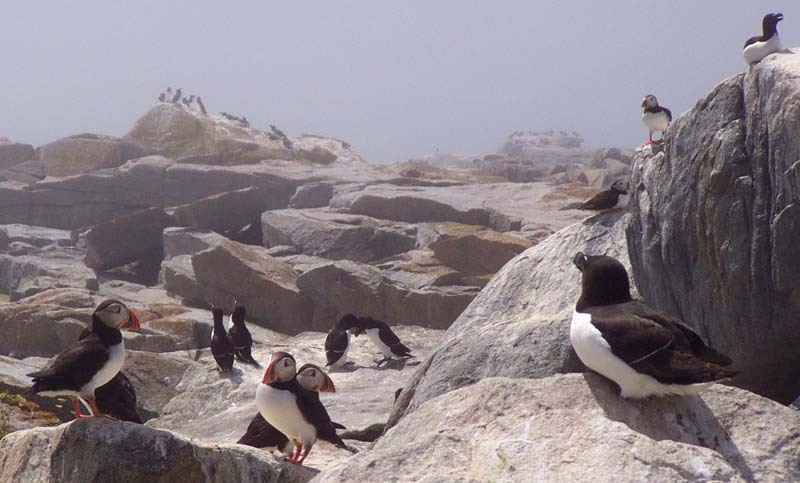 After visiting Gannet Rock for a battery change we then continued a few kilometers north to Green Rock (a.k.a. Green Island). Before our arrival there, we passed by a flock of about 50 Sooty Shearwaters. A single Manx Shearwater was with them. A little closer to Green Rock, a single Razorbill circled the boat a few times. At Green Rock were about 30 Puffins, some Double-crested Cormorants and Black Guillemots nesting. Among the Puffins coming out from some boulders was one Razorbill. After this, we noticed two Razorbills circling the boat. This means the probability of Razorbills nesting here is quite high. This is new! I have seen no recent records of Razorbills nesting in south west Nova Scotia. 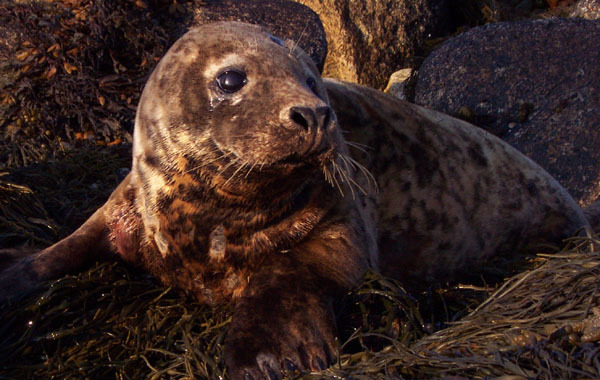 At Green Rock there were also many Common Eiders and seals on the southern rocks of the island. On our way back home we saw 4 Gannets flying by. We stopped for a short visit on Big Tusket Island. 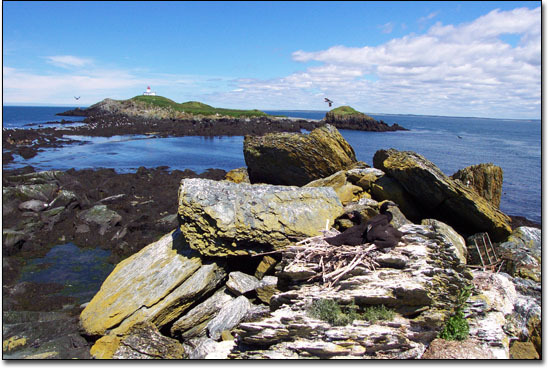 July 28, 2002 - I went with Richard Surette to Noddy Island with a tent as a blind and spotting scope in hand to look for Puffins carrying leg bands. After an unsuccessful hour in the blind and limited time on the island we had to head back to Abbott's Harbour. 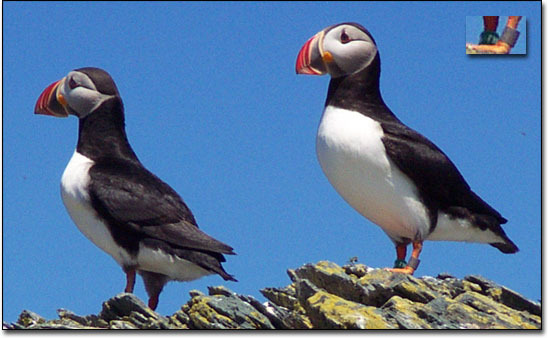 We counted about 60 Puffins there and about 12 at Round Island on our way up to Noddy. They all kept their distance either on the water or circling above and I was not able to examine any legs. 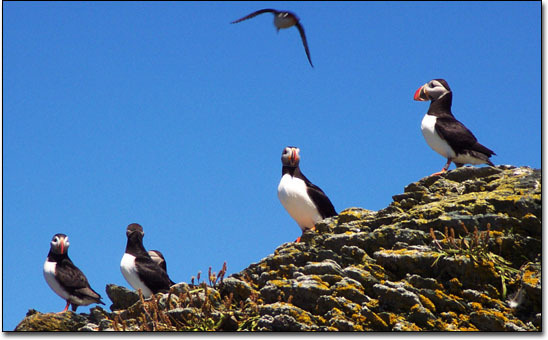 August 1, 2002 - Approximately 90 Puffins were counted on Green Rock. At least two of the Puffins had been banded. Each of the banded birds carried a green band with white lettering on the right leg and a greyish band on the left. There was still a Razorbill in the rocks among the nesting Puffins. I was not able to photograph it. 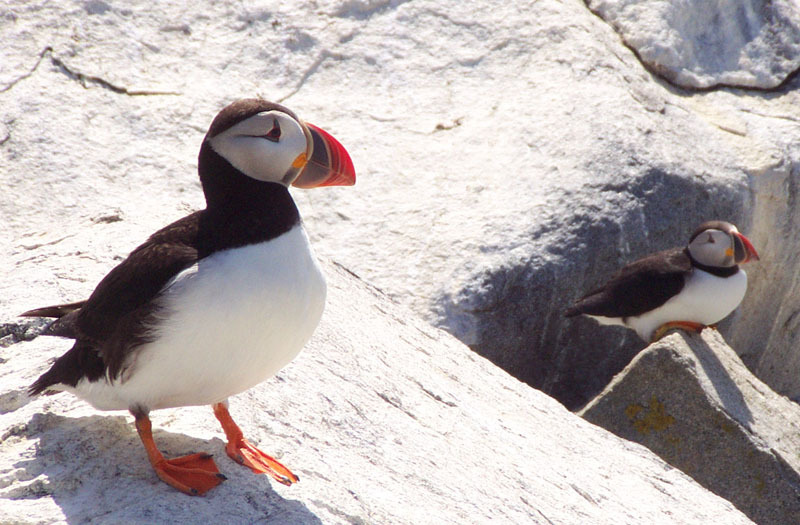 I was able to get unbelievably close to the Puffins with my digital camera and shot a few photos. 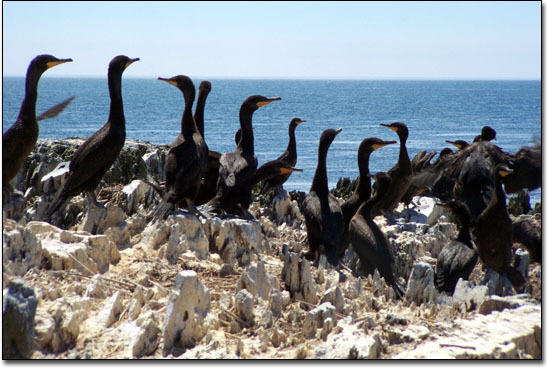 Double-crested Cormorants were also nesting nearby. 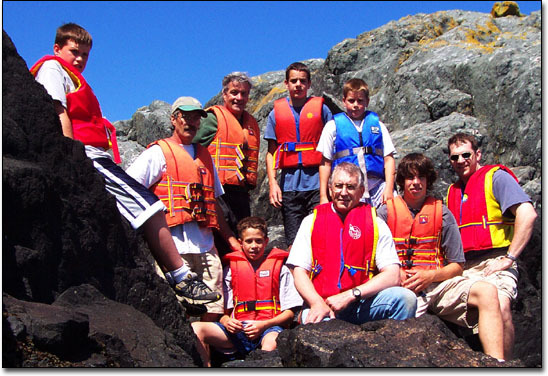 My crew: The Surettes of Chalk River, Ontario, with Jean-Paul d'Entremont, and my brother, Roland. Roland was visiting from Hong Kong where he teaches school. Here are a few Puffin photos from my visit to Machias Seal Island on July 20, 2001.